It’s been a few years since our last Culinary Cowboys ride – our clever synonym for a restaurant review. We came out of hibernation at the insistence of good friend Lia Odell, who wrangled us for “A Night with The Culinary Cowboys” to be auctioned off and benefit the Vista del Lago High School Talon Club, where we were purchased by Dr. Sean Roth and his wife Karen. On this evening, we were seated in the very private Solarium Room. The atmosphere is elegant and perfect for groups of 10 to 30 people. 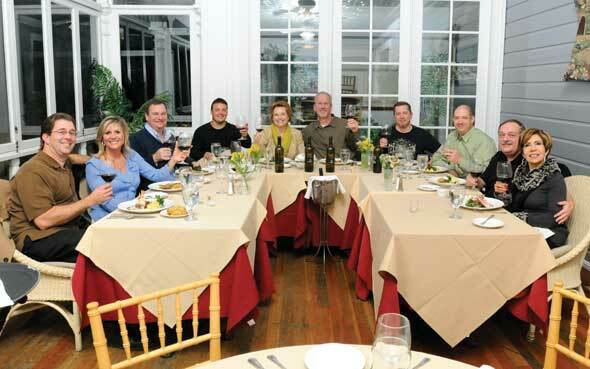 From the moment we were seated, our guests instantly sensed we were in for a delightful dining experience. The night was a special gathering with old friends, new friends and those we hadn’t connected with for some time. Our server, Brad, had the brilliant ability to dazzle and charm a room full of hungry visitors; and he wasted no time in serving up the amuse-bouche appetizer. The explosion of fire-roasted taste was the perfect starter. Imagine a petite chicken cutlet rolled into a trio of crushed nuts (pistachio, walnut and pine), served with pineapple and perfectly paired with a tangy Asian BBQ dipping sauce. Everyone raved. 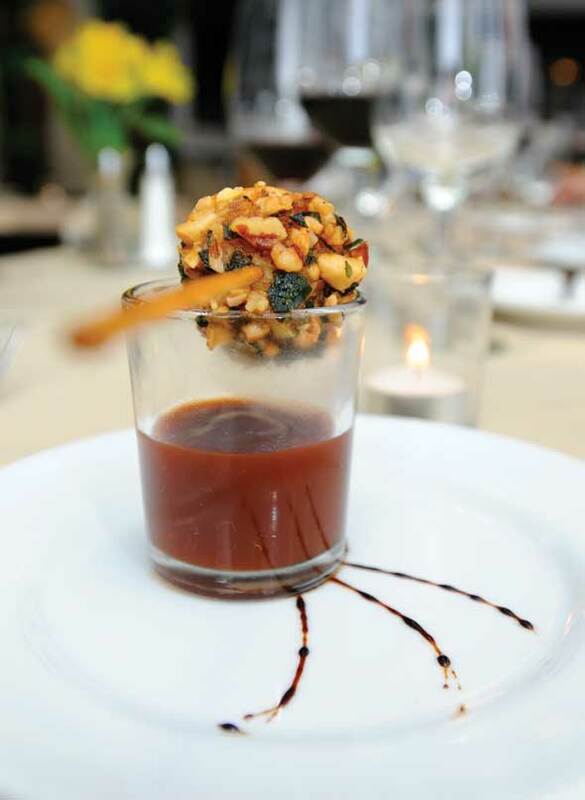 Score for the nut-crusted, chicken-on-a-stick amuse-bouche? A perfect 10! 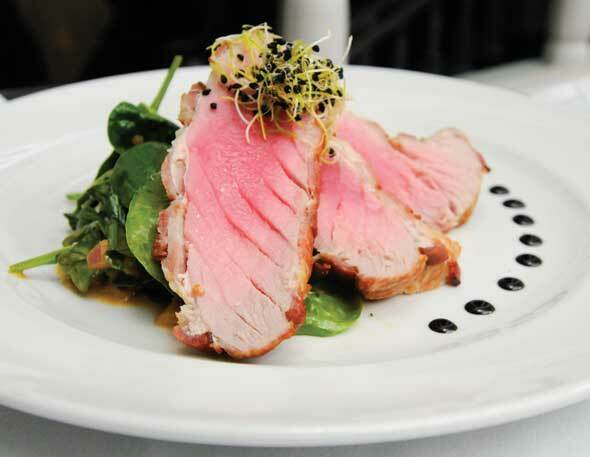 Sequoia has a very diverse full-service menu of traditional choices prepared with great care. And so the ordering began. Ten people and one rule: Everyone must order something different. After all, this is a “restaurant review,” uh, Culinary Cowboy’s ride. First up, Jeff wanted the Cedar Plank Salmon. Adam, the Macadamia Nut Crusted Coalfish…the humor almost writes itself. Leo selected the Petite Filet Mignon and reported it as “exceptionally good.” Meanwhile, Myriam liked the Ahi Tuna Steak, a featured special for the night. We were all a bit fascinated that the tuna was wrapped with bacon, but more on this later. Dr. Roth selected the Black and White a.k.a. filet mignon served with two giant tiger prawns in a glace de veau sauce; and Karen staked her claim on the Lamb Shank – braised on the bone in garlic, tomatoes and port wine. Karen reported that she loved the combination of mild yet distinct flavors. 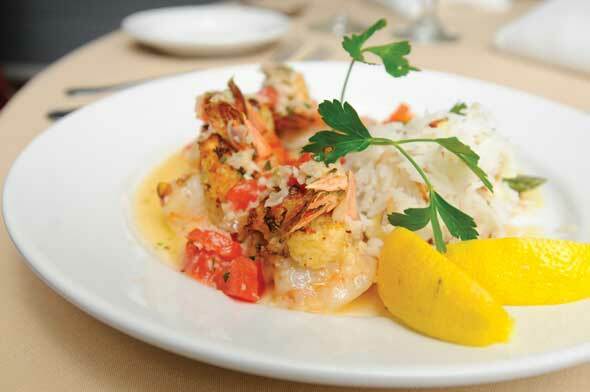 Photographer Dante picked the Crab Stuffed Garlic Prawns and exclaimed, “The complex composition of flavorings did not compete with the shrimp.” This is very important, since shrimp do not like competition. Co-Publisher and honorary Culinary Cowboy Terry was most pleased with his choice of the Apple Grilled Pork Tenderloin, marinated in whiskey and served with a walnut-stuffed baked apple. Wendy took the coveted Steak Diane, which was flambéed tableside (hey look, it’s dinner and a show!) with Dijon mustard, mushrooms, demi-glace and brandy. Good thing Wendy likes to share, as we all had a taste and collectively rated the dish as the culinary highlight of the evening. Pelley landed on the Bacon Studded Organic Half Chicken, mostly because any dish that utilizes the phrase “bacon studded,” must be both handsome and flavorsome…and it was! Our evening had a delightful flow of conversation, mostly around all things Folsom, philanthropy projects, and how popular bacon is with a lot of Sequoia entrées. The true joy of a superior Culinary Cowboy ride has always been the fellowship and small talk over first-rate food and wine. We wrapped up our evening with a cavalcade of shared desserts: Bananas Foster, Apple Tarts, Three Layer Chocolate Mousse Cake and many more delectable treats. Sequoia takes great pride in the fact that all desserts are prepared onsite. So, if you are looking for a delicious culinary experience with a true sense of history and charm, check out Sequoia. You will not be disappointed. The Culinary Cowboys: Adam Frick, Jeff Marmins, Jim Pelley and Buck Shaw (not in attendance this evening). We thank the Roths, the Libermans, and host Style Media Group for their generous donations to Twin Lakes Food Bank and Vista del Lago High School Talon Club.